With A Million Shillings – Escape from Somalia, Alixandra Fazzina records the plight and perilous voyage of refugees across the Gulf of Aden. In a striking pairing, she juxtaposes the obscenely complacent figure of refugee smuggler, Omar, pulling on a cigarette with gusto, with that of a corpse floating in water. By contrast, the start of Maxim Dondyuk’s artist statement, ‘Winter 2013 changed Ukraine’ reads like the opening line of a Shakespearean play. 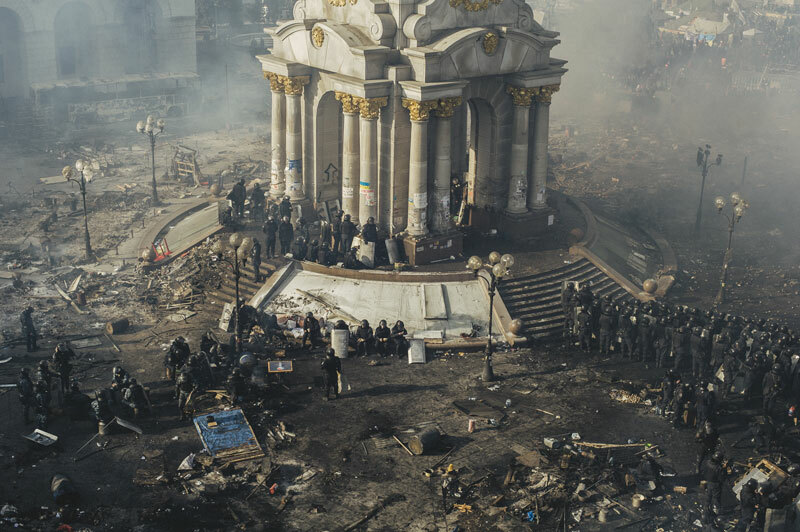 His Culture of the Confrontation series, charting three months of violent clashes between protesters and the Ukrainian authorities, is equally theatrical in feel. His photographs are unsettlingly aesthetic, with their dramatic lights, atmospheric smoke, stage-like settings and seemingly choreographed movements between crowds of protesters and police authorities. In their appealing arrangements and cynical humour, the over-consumption presented by Valérie Belin’s Still Lives could be mistakenly seen as frivolous in comparison to the crying poverty revealed by Pieter Hugo’s pictures of Ghanaian slum-dwellers, sorting the West’s toxic rubbish. The world, they both suggest, is breaking to the seams with man-made waste. But while consumption can be a social class issue, Gideon Mendel’s images of flooded households across the world are a powerful reminder of the undiscriminating effects of global warming. As Kofi Annan eloquently put it at the prize-giving ceremony on 12 November (Valérie Belin took the award), ‘their photographs are silent but have the power to galvanise and call for action’. These artists are the witnesses of the devastating, indelible marks we leave on our environment, on history, and on individual lives. This message took on a poignant significance a day later, when terrorist attacks left Paris, and the international community, dumbstruck. ‘It requires discipline to stay optimistic’, says Danish photographer Joakim Eskildsen, whose work is currently on show in a retrospective at the National Museum of Photography in Copenhagen (until 31 January). His peripatetic journeys have taken him from the romantic coastal landscapes of Northern Europe, to threatened fishing communities in Portugal; from teaching photography in rural South Africa, to investigating Cuba’s unique brand of communist capitalism. 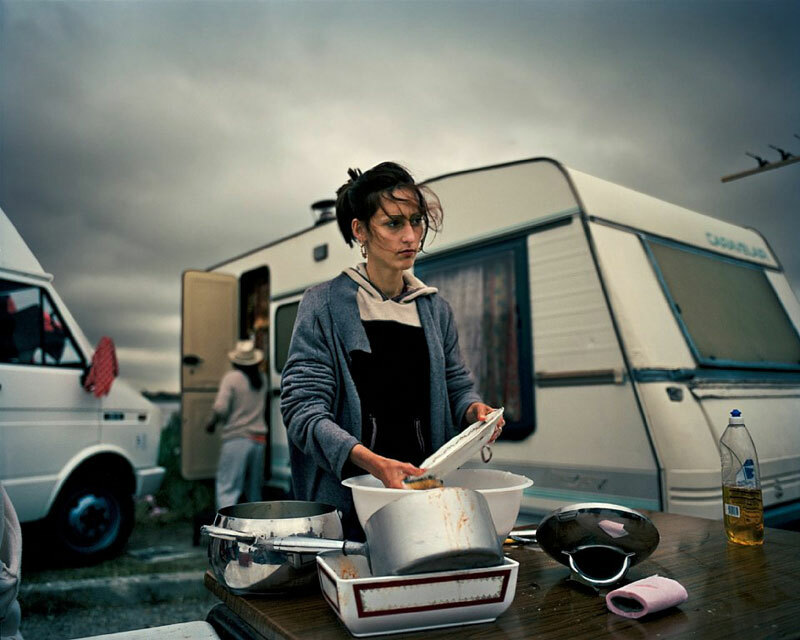 Following itinerant communities across seven European countries, his series The Roma Journeys (2007) unsettles 500 years of prejudice to reveal the Roma as, in Eskildsen’s words, the ‘true Europeans’. In another series, Eskildsen documents the American Realities that have displaced the pervasive myth of the American Dream for many Americans living below the poverty line (approximately one in six US residents). Eskildsen’s sense of light in this series feels uniquely American and recalls that of the 1970s masters of US photography. There is a vintage quality, too, in the saturation of his medium format colour films. Eskildsen’s sympathy for his sitters and their lives is palpable. At the junction of documentary and fine art photography, his approach is immersive: he spends time living with the communities he records. The exhibition likewise plunges the visitor into the different stages of his practice, from an imposing wall of contact sheets, to framed prints, to dummy and finished photo books. A similarly immersive method underlies Noémie Goudal’s Southern Light Stations, a new body of work that debuted at London’s Photographers’ Gallery and explores humanity’s scrutiny of the sky. The exhibition combined monumental pictures, wallpaper installation, and a group of stereoscopic photographs of clouds, set in an architectural structure recalling the lens of a telescope. Though beautiful, the latter works seemed at odds with the rest of the show: stereoscopic viewing calls for intimacy, but in the gallery the experience was disrupted by the scale of the construction and the light flooding the space. It is the larger works that advance Goudal’s well-honed interrogation of perception most impressively. In absurd mise-en-scènes, washed out circles lie subtly detached over washed out skies. Some of these structures seem to be hovering like suspended balloons: others, though man-made, look like cosmic events, ominous eclipses rendered all the more extreme by the blackness of their backdrops. They remind us of the powerlessness of humankind in the face of nature. Wolfgang Tillmans is similarly fascinated with the heavens – ‘Life is astronomical’, he once declared in Neue Welt (2012). On the proliferating tables of his ongoing Truth Study Centre Tillmans makes astronomical time collide with human time. Shots of lenses, screens and structures from observatories used to study objects millions of light years away are linked to pithy comments on ordinary human durations: ‘Now 1980 is as long ago as World War II was to 1980’. Thirty-five years, that are at once significant in in human terms but insignificant, meaningless even, in cosmic terms. 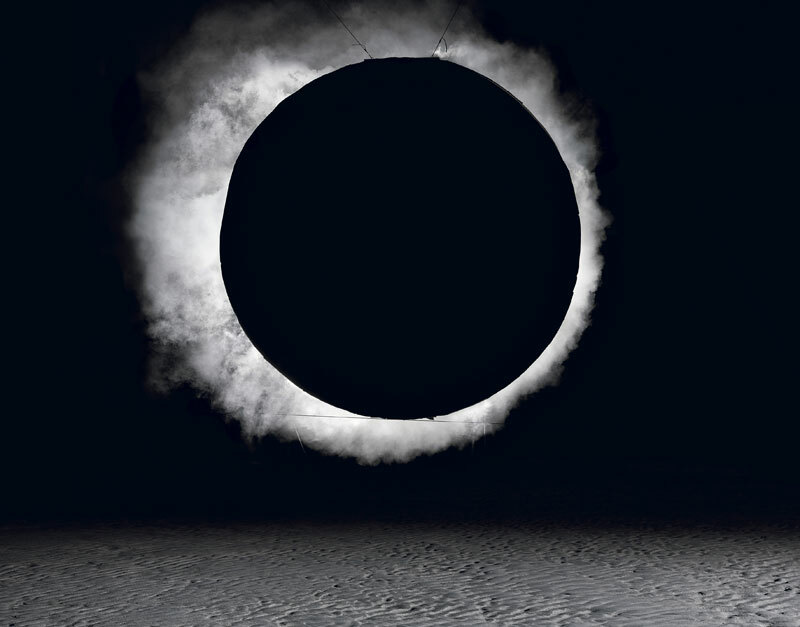 This connection between the mundane and the astronomical is played out further in his two-part video, Printing Press Heidelberg Speedmaster XL – Real Time Total Eclipse Nightfall and Exit (2015), on show for the first time at the photographer’s Hasselblad Award exhibition in Gothenburg (until 14 February). In the first part, Tillmans focuses on man-made rhythms, colour, light, and depths, lingering almost amorously on the hypnotic movements of a printer. To the sound of thumping beats, luscious inks glisten in seemingly impossible colours, sensual and organic. ‘Make it up as you go along’, says a disembodied male voice, reconciling the parts of chance and absolute control that define Tillmans’s work. In the second part of the video work, the Moon’s vast shadow sweeps across the Earth. By recording the changing light, or its lack thereof, Tillmans observes how the eclipse affects environmental surroundings and in turn affects us at a physiological, emotional or behavioural level. The Hasselblad Award is widely recognised as ‘the Nobel prize of photography’ and the related exhibition in Gothenburg has the feel of a monographic retrospective, even though it primarily showcases recent works. Among these are several of what Tillmans calls his ‘extreme photographs’ in which the digital camera’s sensitive chip records the minutest features of a subject. 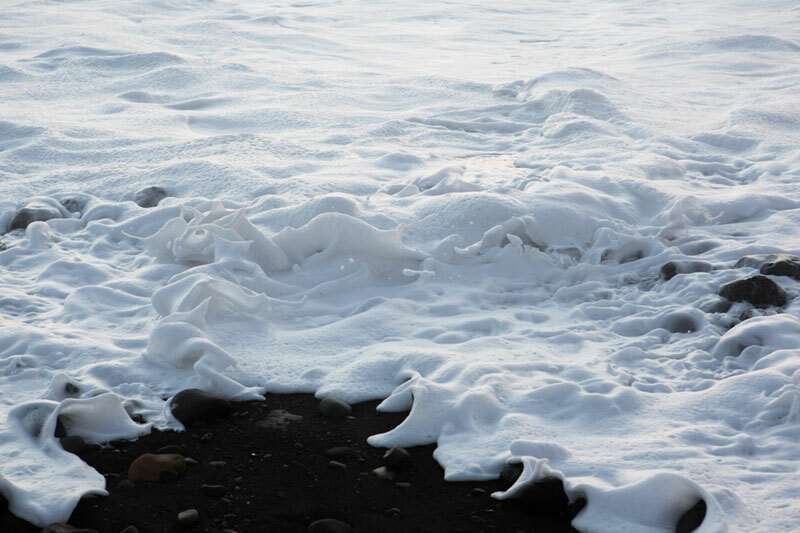 Shot in 1/4000 of a second, La Palma shows a foaming wave frozen in action in all its hyper-real, hallucinogenic detail. Captured like this, the wave looks sculptural, alive even, as if it were a creature, slowly creeping onto the shore. An exquisitely detailed chopped-off agave on newspaper is the subject of another of these extreme pictures. Its depth of colour and the quantity of information it contains are more than the brain can hold. One would be forgiven for overlooking the newspaper’s headline about the effects of YouTube on jihadism. With works such as this, Tillmans continues his exploration of the materiality of images in tandem with subjects of pressing political and social importance. As 2016 begins and one makes the inevitable evaluation of the past 12 months – defined by a refugee crisis, floods and droughts, terrorist attacks across the globe, the rise of the extreme right and a deepening financial crisis in Europe – it is encouraging to find that photography retains its social, human edge. And the medium seems richer than ever, not just in terms of its critically engaged content, but also in its questioning of the formal and material language of photography. The Sixth Prix Pictet, Disorder, was at the Musée d’Art Moderne de la Ville de Paris from 13 November–13 December; it is on display at Somerset House until 17 January, before continuing its international tour. ‘Noémie Goudal: Southern Light Stations’, was at The Photographers’ Gallery, London, from 2 October 2015–10 January 2016. The associated publication is available from the gallery bookshop. ‘Joakim Eskildsen: A world I can believe in’, is at the National Museum of Photography, Copenhagen, until 31 January. Wolfgang Tillmans’ Hasselblad Award exhibition is at the Hasselblad Foundation, Gothenburg, until 14 February.